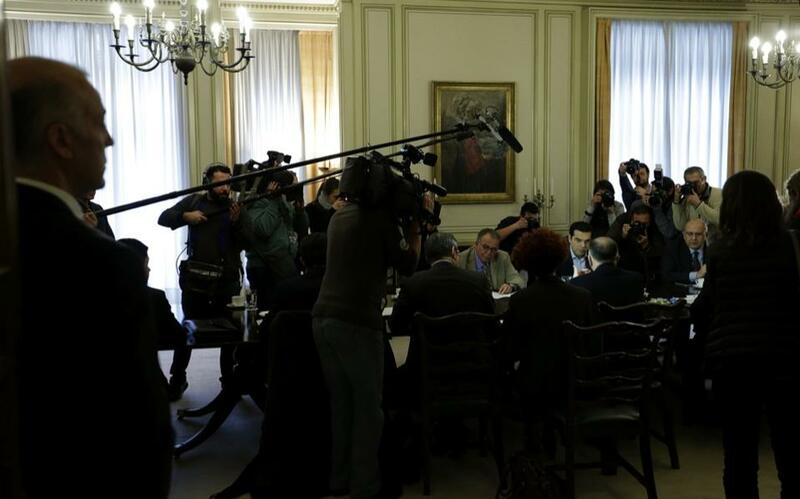 Delegations from Greece, France and Germany attend a meeting on the refugee crisis at the Maximos Mansion in Athens, on Friday. Greek authorities agreed on Friday to recognize Turkey as a “safe third country,” which means migrants for whom Turkey is a country of transit, not of origin, can be returned there. The decision was announced after a meeting in Athens between Greek Interior Minister Panayiotis Kouroublis and his French and German counterparts, Bernard Cazeneuve and Thomas de Maiziere. The goal “cannot just be to register arriving refugees and to relocate them equitably [but above all] to reduce the flow,” said de Maiziere at the end of his two-day visit. He added that Germany is sending 100 police officers and two coast guard vessels to Greece. Cazeneuve said he is in favor of the European Union border agency taking on greater responsibility. Data from the passport-free Schengen zone must include “terrorism [records] by police and intelligence agencies, and conditions must be created to link the Schengen system to other criminal records,” Cazeneuve told reporters. Greece is under pressure to complete the creation of more “hot spots” for registering refugees and migrants later this month. Athens has enlisted the help of the army to carry out the work. As of yesterday, 94 prefabricated structures had been delivered to the site in Chios and 87 on Leros. Construction work was under way on Samos, where an old army firing range is being converted. On Kos, riot police who had been sent to the island from Athens fired tear gas to deter some 100 locals who tried to force their way into a disused army camp that is being turned into a hot spot. European Union sources told Kathimerini they are hopeful that at least three of the five centers will be ready in the next few days given that the army is now coordinating the work and humanitarian aid has arrived from other EU member states.